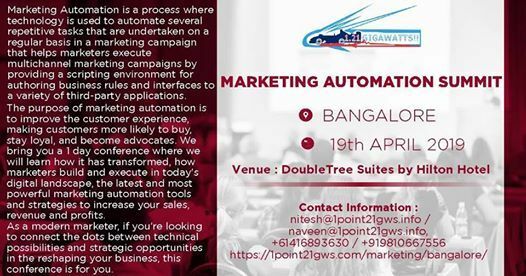 Marketing Automation is a process where technology is used to automate several repetitive tasks that are undertaken on a regular basis in a marketing campaign that helps marketers execute multi channel marketing campaigns by providing a scripting environment for authoring business rules and interfaces to a variety of third-party applications. The purpose of marketing automation is to improve the customer experience, making customers more likely to buy, stay loyal, and become advocates. 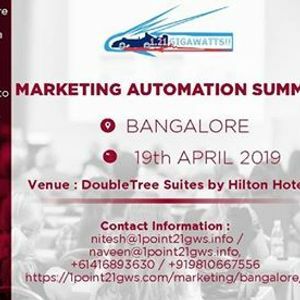 We bring you a 1 day conference where we will learn how it has transformed, how marketers build and execute in today's digital landscape, the latest and most powerful marketing automation tools and strategies to increase your sales, revenue and profits. As a modern marketer, if you’re looking to connect the dots between technical possibilities and strategic opportunities in the reshaping your business, this conference is for you.